When I realized that one of the key new features in Adobe Premiere’s 2018 upgrade was collaboration, I asked the folks at LumaForge to loan me a Jellyfish unit for my team and I to use to create my latest Adobe training. In return, I promised to review it. Sam Mestman, CEO at LumaForge, generously loaned me a 24 TB Jellyfish Mobile for six weeks. My storage needs were fairly small and my workgroup only consisted of four computers, so I opted for a smaller Jellyfish. I’ve been using this for the last month and here are my thoughts. Why do you need a Jellyfish? One word: Collaboration. Jellyfish, from LumaForge, provides high-performance shared storage designed for small workgroups focused on video editing, VFX and color grading. Audio mixing is supported as well, but doesn’t require the high-performance bandwidth of video. 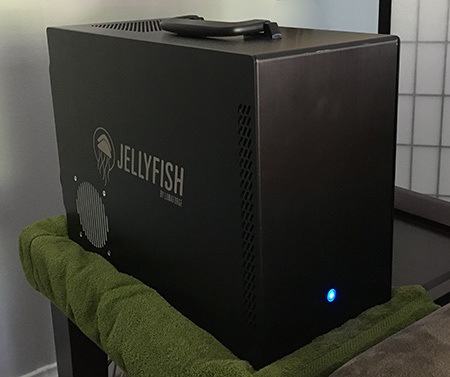 The Jellyfish comes in three sizes: Mobile, Tower and rack-mount. While capacities vary, the operation of the three units is the same. The benefit to using a Jellyfish is that each user is directly attached to the storage. This provides the fastest performance for each user – more on this in a bit – but means that you need to think about your editing needs before ordering a system. How many users need to access the system, both in total and at the same time? What video codecs are you editing? Will you be editing multicam material? How much source material will this need to store? It is important to realize this custom configuration occurs prior to delivery. This is different from purchasing off-the-shelf Network Attached Storage (NAS) where there are not configuration options. The size of a sewing machine, weighing about 25 pounds with an easy-carry handle, the Jellyfish is configured by LumaForge prior to delivery. From a hardware point of view, connecting is easy. Plug in a power cable, attach the direct connections and you are done. However, from a software point of view, it took three calls to tech support to get this running. Configuring network hardware is never easy – especially for non-engineers. However, LumaForge tech support is excellent. The first call was to get the direct connections running. The second call was to enable access through a switch. Both were successful after a screen sharing and a couple of emails. If this were a stand-alone hard disk, once I got the system running I’d fire up the disk speed testing utilities from AJA or Blackmagic Design and analyze the numbers. But this is the wrong approach for workgroup gear. When it comes to video editing, the key word is “bandwidth.” This is SO critical that I want to take a bit of time to explain this. NOTE: “Bandwidth” is defined as the speed a storage device transfers data to and from the computer. While read (playback) and write (record) speeds vary, for the purpose of this article we can consider them the same. 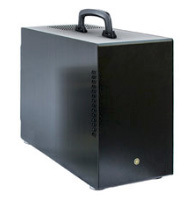 The Jellyfish combines multiple hard drives into a RAID, or a collection of hard disks, configured to provide speed, capacity and data redundancy in the case of a hard drive crash. Fully loaded, the Portable supports up to 240 TB transferring data up to 2,200 MB/sec. The two bigger units support up to 800 TB with a data transfer rate up to 4,400 MB/sec. The problem is that no single user gets all that performance. Nor should they – this is SHARED storage, which means that both storage capacity and bandwidth are shared between all the users connected to this device. 720p/30 HD ProRes 422 is about 9 MB/sec. 1080p/30 HD ProRes 422 is about 18 MB/sec. 1080p/30 HD ProRes 4444 is about 41 MB/sec. UHD/30 ProRes 4444 is about 165 MB/sec. 8K/24 ProRes 4444 is about 707 MB/sec. NOTE: RAW and LOG files create media streams that are larger than these rates. Multiply each of those streams by 2 for each edit station, then multiply, again, by the number of editors using that shared storage at the same time. THIS is why bandwidth is so important! Individually, each editor doesn’t need that much. But, together, they can drive almost any system that is not properly configured to its knees. NOTE: For multicam editing, if you are using shared storage, you are best off using proxy media for the edit, then switch to high-res files for color grading and final output. The real challenge in getting shared storage to work is determining how your editors will connect to the unit. A 1.0 Gb Ethernet connection transfers data at a maximum speed of about 125 MB/sec. (Yup, about the same speed as a single hard disk. WiFi is MUCH slower.) This is fine for connecting any edit station editing SD or HD media. But, as you can see from the numbers above, this is totally inadequate for higher resolution media. This means that each edit station that needs better performance will need to attach to the device using a faster protocol, such as FibreChannel or 10 Gb Ethernet. This is why thinking about what you need to edit is critical before purchasing a system. NOTE: 10 Gb Ethernet is roughly ten times faster than 1 Gb; in other words, a bandwidth of about 1.2 GB/second per edit station. The hard work isn’t in the operation, its in properly configuring shared storage before you buy it. 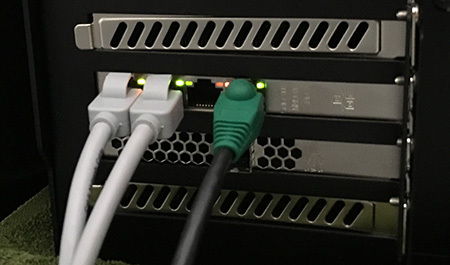 NOTE: NAS systems that attached through a switch are limited by the bandwidth supported by the switch. Most switches are optimized for standard computer data, not video. This means that you won’t get the fastest performance through a switch. Once configuration and setup is complete, run the Jellyfish application to find and mount the drive. Once mounted, the drive icon shows up on the desktop like any other hard disk. At which point, you start editing. Operationally, there’s nothing different about the Jellyfish than any other mounted drive – except that you are sharing it with everyone else on your team. In my workgroup, I had the two edit stations connected directly to the Jellyfish using 1 Gb Ethernet. I was consistently able to get 125 MB/sec throughput with no bottlenecks for editing. Performance was smooth and I never felt that I was waiting on the storage. 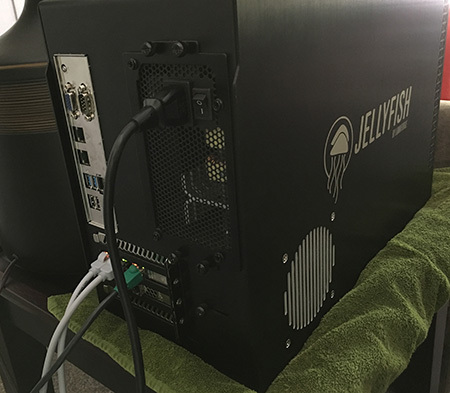 I also dedicated a stand-alone computer to access the Jellyfish through a switch. This system handled all video compression and posting to the web. While configuring the Jellyfish to work through a switch required two calls to tech support, once it was set up the system worked perfectly. We were able to easily and seamlessly run Premiere Team Projects, Shared Projects and share Final Cut Pro X libraries between all team members without relinking media – provided both projects and media were stored on the Jellyfish. To help me learn more about the system and where it fits in post-production, I emailed ten questions to Sam Mestman, CEO of LumaForge. Here is our conversation. Larry: Why did you create JellyFish, as well as the rest of your storage products? Sam: We built the Jellyfish to solve our own problem, which was how to find affordable, high performing, easy to set up and maintain shared storage that was optimized for video workflows, and that was quiet enough to live in the room with you while you worked. We found that the existing systems were not really approachable to the average video team, especially without proper IT support, as they tended to not perform well and were difficult to setup and maintain. Essentially, if you didn’t have a high level of technical knowledge, it was almost impossible to work in a shared environment for video work. Not only that, but once you did get it set up, especially for applications like FCPX that require a high level of responsiveness, performance tended to be really poor. Once we realized we could build something that was preconfigured and really performed for what editors wanted to do with it, we realized we had a product. Larry: The more I work with JellyFish, the more I appreciate how helpful a server can be in small workgroup editing. But, why JellyFish? For a fraction of the money, I could buy a Synology NAS with equal capacity? Sam: Well, what I can tell you is that we don’t skimp on hardware. When you add up the raw cost of what’s in a Jellyfish vs. some of the low priced alternatives, the components that are in the Jellyfish cost more than what the MSRP of the low cost NAS cost. What you really get with the Jellyfish is performance that is optimized for video. We leverage 3 levels of caching into what is essentially a giant Hybrid drive that your entire team can use for video. Most cheap shared storage products use cheap hardware with poorly integrated file systems that work great for pdf’s and music, and 1-2 video editors… but when you start having people really hit the system like pro editors do, completely bogs down and becomes unusable. From even our most basic Jellyfish Mobile environment, we provide an experience that is designed from the ground up for pro video teams and will not sell a product that we wouldn’t use ourselves. 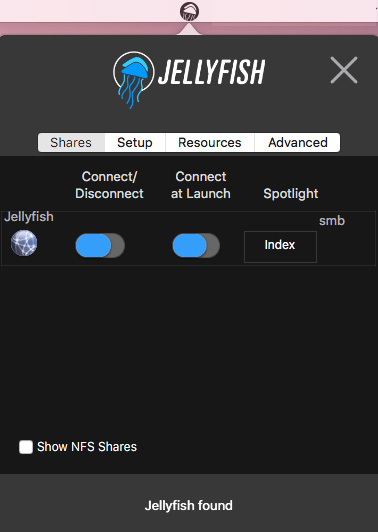 Larry: What features does JellyFish have in addition to shared storage? Sam: We are the only shared storage solution that is optimized out of the box for FCPX libraries and hard links (via NFS), fully support Adobe Team Projects, and has a Resolve Collaborative database built into it. You can use an inexpensive 3rd party product (MIMIQ) for Avid Bin Locking, and are fully compatible with Open and Active Directory services. It’s also fully compatible with Mac, Windows, and Linux machines, and there is no licensing for our client software. 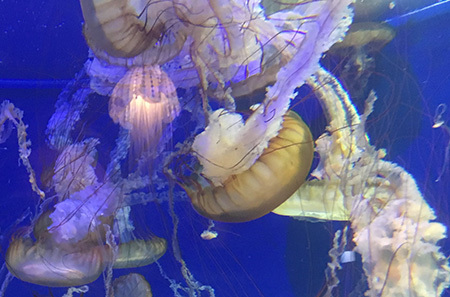 We work great with all the existing MAMs, have deep archive and snapshot capabilities, as well as the ability to remotely access files on the Jellyfish when connected to a network. Lastly, we offer workflow support to our customers so whether you’re in FCPX, Premiere, Resolve, or Avid, we can help you solve your workflow issue and take our support and relationship with our customers to a whole other level than any other company would be willing to do. We are also not even close to done. In fact, we are just getting started. Larry: One thing I like about JellyFish is its portability. What do the larger models provide that JellyFish doesn’t have? Sam: Basically, more storage, more performance across more users, more expandability, and some deeper connectivity options (25, 40/50, and 100G). The Jellyfish Mobile was fundamentally designed to allow 2-6 users to work largely without compromise with up to 80TB Raw (expandable up to 240TB), and was essentially designed to replace the small drive period that accumulates in every small workgroup. The Jellyfish Tower was designed to be its bigger brother with up to 20 direct 10G ports that you can connect to right out of the back, with up to 200TB available to your team (and expandable up to a petabyte). Just as quiet as the Mobile unit, the Tower is the perfect solution for mid sized teams who don’t have server rooms but have a large amount of assets. The Jellyfish Rack is identical to the tower except that it’s designed to be rack mounted. The ShareStation is for Enterprise teams that have the most demanding needs in the pro video world. Built on a 100G ethernet backbone… it’s honestly insane how much bandwidth we can pump through to you and your teams and is fundamentally designed to remove the limitations from your team’s workflow. Larry: How should we decide what shared storage device to get? Sam: More than anything else… ask whoever you’re buying from to give you a demo or really talk to you about your workflow and get into the details of what you’re trying to do. Knowledge of workflow and what your storage can and can’t do in the real world is THE MOST important thing. Many people will just try to sell you a box to hit a quota or a budget which will often leave a the customer with a bad taste in their mouth after purchase… very few will try to sell you the right thing for what your team is trying to do. Also, be very wary of anything that asks you to set it up yourself and have a deep understanding of networking… unless you want to spend more time configuring and troubleshooting your storage than you want to spend actually using it. Put simply… Don’t buy the world’s cheapest thing and expect it to blow the doors off performance wise. Also… if the sales person can’t speak to you in real world terms or explain how you can easily get up and running with your system/know the ins and outs of your workflow… run away. Larry: Which specs are the most important when choosing shared storage – is it simply capacity? Sam: The most important specs are latency, how well it caches, and a WORKING storage number (we are the only vendor who really tells you this, btw. Raw storage numbers are largely worthless… the real question is how much space is left after parity AND a 20% performance buffer that you shouldn’t go below (we apply this to every one of our systems by default to prevent you from injuring your volume). Larry: How does increasing resolution or support for HDR change our needs for shared storage? Sam: Increases the requirements exponentially. Going from HD to 4k quadruples your storage, and then quadruples again going to 8k. Not only that, but it becomes critical that your shared storage is optimized for high resolution video, or you’re going to spend your days watching beach balls. Larry: When do we need to step up to either a Thunderbolt direct connection or 10 Gb EtherNet? Sam: If you’re going to do more than 7 streams of prores 422 HD video (or 1-2 streams 4k) on a single computer, it’s time to go to 10G. Also, you’ll get better library performance over 10G. Larry: What feature in the JellyFish do you think people know the least about? 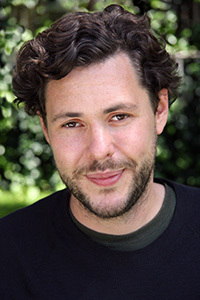 Sam: The responsiveness… which is something you can only feel as you edit. If you’ve been living on an Xsan, it is not a very responsive experience, and it’s often why most people who edit with FCPX can’t keep their libraries on the network… because they get bogged down. On the Jellyfish… it just works. That’s the thing we’re most proud of. We’ve taken something incredibly complex and really tried to make it simple and usable for people so that they hopefully just forget that it’s there at all. Larry: In one paragraph, explain why editors should consider LumaForge gear? Sam: Built by editors for editors. You are getting shared storage that is designed to think the way you do, and is designed to save you time and complexity. Built from the ground up only with video workflow in mind, there is not another company on the planet that cares more about their customers’ experiences with their workflows than we do. In an age where everything is automated, no one cares about you once they’ve made the sale,no one on the support line can ever give you a straight answer, and nothing ever seems to do the thing you wanted it to do, we really just wanted to make something that makes our lives and the lives of our customers easier and more pleasant. That’s our goal. The thing that makes us proudest is when we see the workflow doors our customers are kicking down, and seeing all of the new and amazing things that people are able to create because they have more time to spend on their story and the right gear for the right job. The system is supposed to automount automatically on restart. I never got this to work consistently in Sierra. With High Sierra, it seemed to mount reliably every time I logged in. Configuration through a switch, especially when DHCP is handled by the switch or your Internet router, is very tricky. The user manual is not helpful in this instance. Expect to need tech support and a screen sharing session to get this configured properly. Working with earlier versions of the macOS requires using an earlier version of the LumaForge software called “SharePoint.” You don’t realize how far we’ve come in making networks easy to use until you run this software. I like the new software MUCH more than the earlier version. If I were buying this for my company, I’d make a point to install 10 Gb connections for all direct-connected edit stations. This will cost more, but future-proof the system so I don’t need to worry when I step up to higher resolution HDR material. The Jellyfish is a very big, very fast RAID which is shared amongst all the members of an editorial workgroup. After it is setup, it is as easy to use as any other hard disk. Time needs to be spent in carefully thinking through what you will be editing and what kind of system you need. You also should allow a day to get this set up. It won’t take that long, but you should not expect to be up and running the instant you plug it in. The Jellyfish costs more than a standard NAS. What you are paying for is performance and a system optimized for your team. Once the system is setup, it could not be easier to use. And sharing projects and files is as easy as you would hope. Is this work on windows???? You would need to contact the folks at LumaForge and ask them. My suspicion is that it would, only they know for sure.